The Second Glorious Mystery - the Ascension of Christ – from the Gospel according to Luke, chapter 24, verses 46-53. And he said to them, "Thus it is written that the Messiah would suffer and rise from the dead on the third day and that repentance, for the forgiveness of sins, would be preached in his name to all the nations, beginning from Jerusalem. You are witnesses of these things. And (behold) I am sending the promise of my Father upon you; but stay in the city until you are clothed with power from on high." Then he led them (out) as far as Bethany, raised his hands, and blessed them. 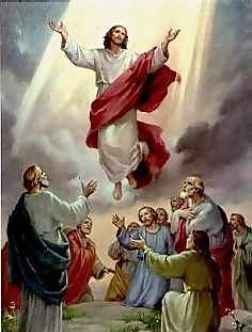 As he blessed them he parted from them and was taken up to heaven. They did him homage and then returned to Jerusalem with great joy, and they were continually in the temple praising God. “This final stage stays closely linked to the first, that is, to His descent from Heaven in the Incarnation. Only the one who 'came from the Father' can return to the Father: Christ Jesus". (Article 661 of the Catechism of the Catholic Church). While meditating on the mystery of the Ascension of Jesus, pray also for the release of its fruit, hope. Repeat the 'Hail Mary' 9 more times, while moving along each remaining bead in the group of ten (the 'decade'). Next, pray the 'Gloria Patri' : See rosaries with added 'Glory Be' & 'Fatima' beads! Next, pray the 'Fatima Prayer' : See rosaries with added 'Glory Be' & 'Fatima' beads! This concludes the Second Glorious Mystery. Click here to continue with the Third Glorious Mystery. Continue with the closing prayers of the Rosary (if you are praying this one decade only).